*Fish sauce in a Southeast Asian condiment that is made from fermented fish. It is strongly flavored, but in small quantities, adds a depth of flavor to this and other Southeast Asian dishes. 1. Place cellophane noodles in a large pot of boiling salted water. Cook for about 4 minutes or until they are al dente. Drain and rinse under cold water. Let drain thoroughly. 2. Place noodles in a large bowl. Add celery, daikon, cucumber, green onions, and cilantro. 3. In a separate bowl, whisk together soy sauce, lime juice, sirachi, ginger, fish sauce, and sugar until well combined. Pour over the noodles and vegetables. Stir until well combined. 4. Dredge shrimp in rice flour. In a hot saut� pan, saute dredged shrimp in oil until cooked through and lightly browned. 5. Place noodle salad in individual serving bowls. 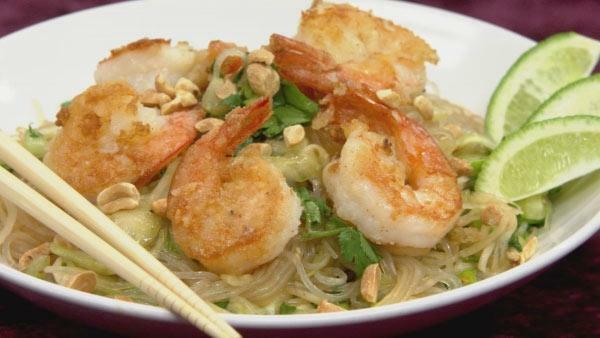 Top with shrimp, sprinkle with peanuts and serve.